electric fans dry your new tan. The drying time takes between 5 - 10 minutes. Your privacy and comfort are formost! You are never left to dry in a room full of other people! The only time you see other people is when you are waiting for your session, and none of you can see the current clients in their session, either airbrushing or drying. This setup is in a conference room and only clients currently being airbrushed are allowed in the room. 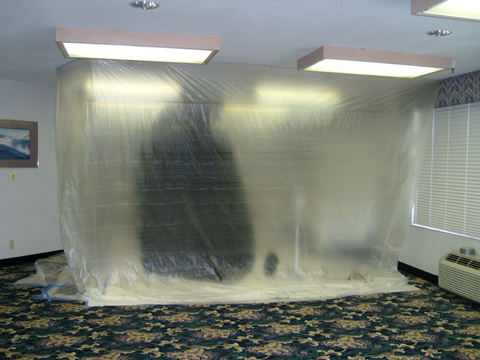 This particular room was much larger than needed, so we hung plastic to meet our needs, which is about 16' X 18'. If you have any questions regarding our process or any other questions, please feel free to contact us by phone or email ( Contact Us ). This site is © Copyright NorthWest Competition Coloring 2013-2014, All Rights Reserved.